One or two students nodded, but the majority looked at me like I was crazy. Even my most perceptive readers looked confused. 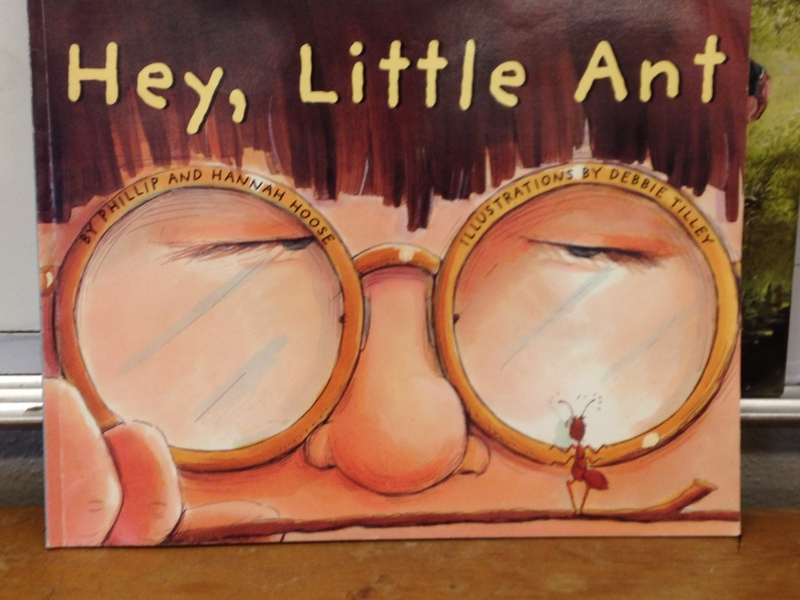 I was losing them, so I dropped it and pulled out Hey, Little Ant by Phillip and Hannah Hoose. 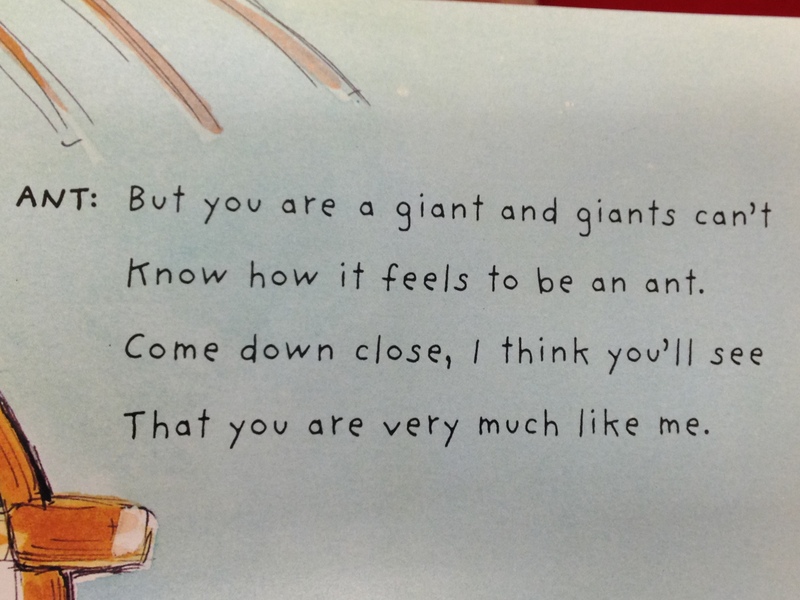 In this story, Kid feels it’s his right and duty to crush Ant, but Ant begs Kid to see the world through his eyes. I ask students, do you see bits of yourself on this page? Have you ever felt this way? At first they identify with Kid. Bingo. 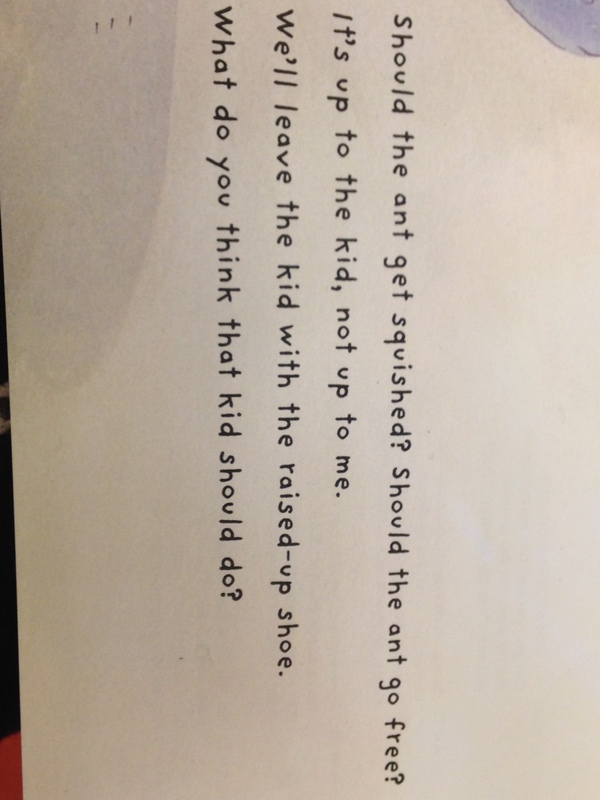 A shift from Kid to Ant. For a moment, they see themselves in this character. Ant is them. How could they not see they were being the bully they hated in the story? I hadn’t considered they didn’t see themselves in characters. This week we will be practicing finding ourselves in picture books characters. Today students had a tiny aha. I had a big aha. Maybe more will be found if we just clean our lenses and look for it. 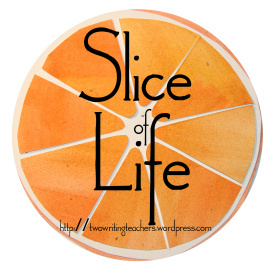 Thank you, Anna, Beth, Betsy, Dana, Stacey and Tara of Two Writing Teachers blog for hosting the Slice of Life March Story Challenge. Read other bloggers slices here. 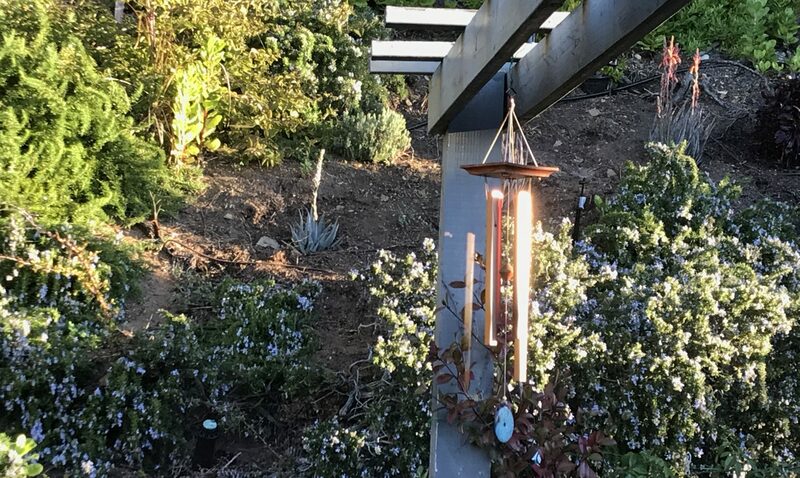 #SOL15: Day 18, Can you see yourself? Wow, I never thought about this. But they must connect with characters! Now you have me wondering is this is a huge misconception I have. Thank you for this post. I will definitely check into this with my kids as well! PS – I also love that book. I love moments like this, when the classroom becomes a place where gentle explorations and conversations like this can take place – we address the whole child, consider those lasting lessons. I love how you NEVER give up although you do switch gears, change plans and restart! When kids “repeat the phrase or rote learning” it’s so not enough . . . we have to see their understanding in their actions. Thank you for the reminder of the need for this “stick-to-it-iveness” that means that students really do UNDERSTAND! Your idea to see ourselves in the picture book characters is good, Juieanne. Since I’ve been working on Point of View with my students, this is something I’ll ask directly to see what the older ones say. Thank you, Terje! I will ask this today! Love these peeks into the lessons you deliver that guide your students into being the best person possible. These moments have the possibility to be life changing. Such a wonderful example of authentic assessment. I love how you listened, taught, listened and planned next steps in your instruction. Thanks for sharing. I love how you find a way for the kids to connect with the story or at least let them figure out they can connect! What a great reflection, Julieanne. I wonder how many readers don’t make the connection between themselves and the characters. I love that you stopped and worked at the aha moment. This is why I read…to connect to the character. I asked the question “Why did the poet use the word you in the poem?”, and a perceptive student said “to connect to the reader.” Ah, they do see. Give them time. And keep reading! What a wonderfuL moment to capture. I love the meaningful connection to the character. Great lesson for students and teacher! I love how you give us glimpses into your classroom from so far away. Keep sharing so we can keep learning. Sounds like a great day for you and your students! To be a student in your classroom must be a joyful and engaging experience. You are so smart, Julieanne! I love how you were able to reach for the perfect book for perspective-taking at exactly the right moment, and how you used this experience to realize that we sometimes “have to clean our lenses” and see things a little more clearly. Such good advice!